This is a seriously great post with so many options!! Love love love all of the pink! I have pink Hunter boots, and they are a staple in my closet. They would make the perfect gift for anyone who loves pink! Such a cute gift guide and I love the pink! I definitely need that 'Capture your Style' book! Love all the pink goodies here! I have a variation of those kendra scott earrings and love them! This gift guide is evey pink lover's dream. I've been thinking about getting a camera like that, it seems so fun for snapping pictures of friends! ooo I love this gift guide babe, I love blush pink. You are speaking my language! Love all this pink so much! I literally want just about everything on that list. Loving the camera and Hunter boots for sure! 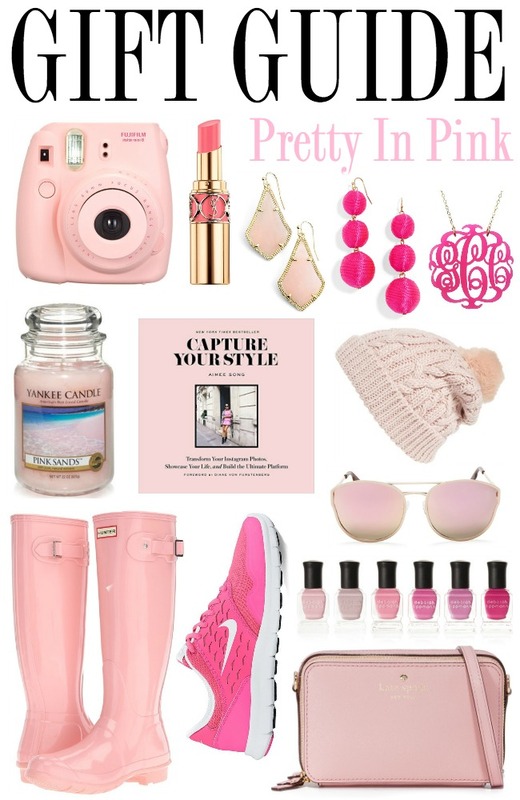 Pink's my favorite color so this gift guide is perfect! I love the pink polaroid camera! I absolutely LOVE that you did this, I love pink and practically live in a pink world. I already have that camera and the book on my list! Pink is my favorite color so I love this! I seriously want everything!